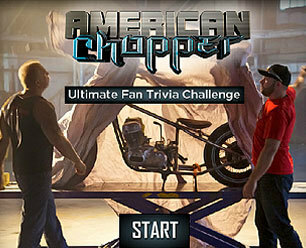 With the American Chopper series coming to an end--and everyone gearing up for American Chopper Live next week--we thought it was a great time to celebrate a decade of the Teutuls with the American Chopper Ultimate Fan Trivia Challenge. Think you know everything there is to know about American Chopper? Then take the quiz and share the results with your friends. From Senior's boot size to Rick's first OCC build, the Ultimate Fan Trivia Challenge will separate the champs from the chumps when it comes to all things Chopper. Don't forget to tune in to Chopper Live: The Revenge on Dec. 10 and 11 at 9/8c to watch the ultimate bike build-off.